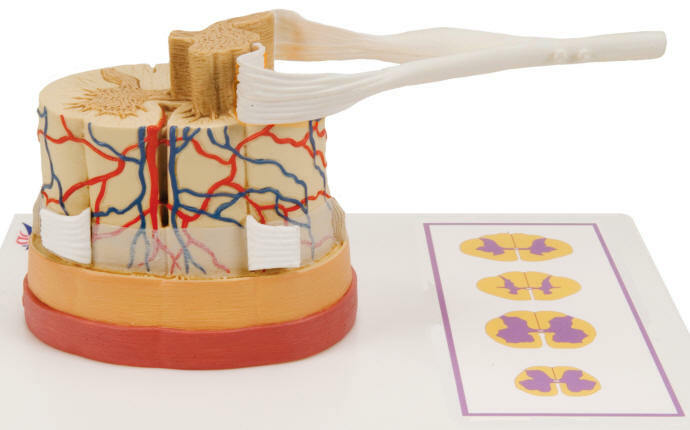 This model illustrates the composition of the spinal cord, magnified to a scale of about 5:1. The spinal cord is formed by a central channel surrounded by "gray matter" with an outer layer of "white matter". The base features illustrations of various cross-sections of the spinal cord through the white and gray matter at the neck, torso and lumbar and sacral regions. The Spinal Cord with Nerve Endings model is supplied on a base. It is a great tool for teaching the anatomy of the human nervous system. 6 times life-size, this vinyl plastic model replicates a segment of the upper thoracic spinal cord. Sectioned both longitudinally and in cross section, a portion of white matter of the right half has been cut away to expose the anterior and posterior nerve roots. 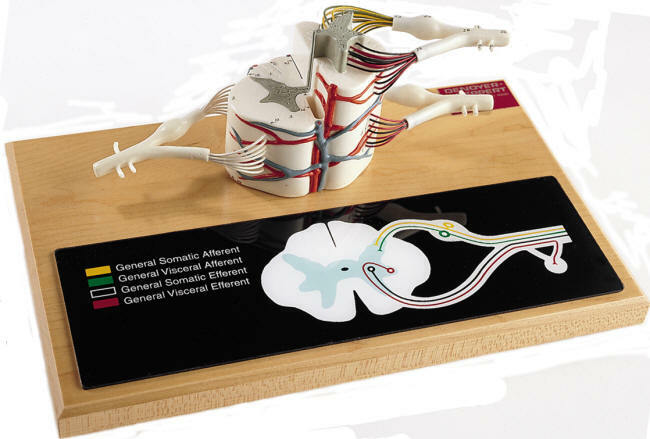 Color-coding differentiates them and a color-keyed circuitry schematic is mounted along with the model on a hardwood base. 30 numbered features are identified in a corresponding key.